President Ibrahim Mohamed Solih delivered his inaugural address at the opening of the People's Majlis for 2019. Himself a politician who served on the parliament for 25 consecutive years, the public were restless to hear his first address at the parliament as President of the Maldives. Needless to say, he did not disappoint. The Presidential address effectively addressed all the key issues faced by the country, leaving behind a sense of hope in the hearts of the people. In his address on Thursday, he outlined the policies of the government, and his strategy to battle some of the biggest issues maiming the country: Corruption and kleptocracy, and unreliable judiciary. The President declared a zero-tolerance policy against corruption. A bill has already been submitted at the parliament to criminalize unlawful acquisition of wealth and prevent corruption, revealed the president. The President recalled his presidential promise to reform the judiciary, and reiterated that delivering on this promise is of utmost priority to the government. "To guarantee the rights of the people, and assure them that justice and freedom will prevail, reforming the judiciary is one of, if not the most, important and pressing issues to be addressed. The courts and judges must take the road to reform if we are to see any peace and stability in this country", stressed President Solih. He also highlighted the importance of improving and strengthening the parliament in order to reform the democratic system, and called upon its members to expedite the bills currently submitted to the parliament, including the bills on Misappropriation of State Property and Funds and the investigation of Unsolved Murders. "The past four years saw this esteemed Majlis stripped of its ability to carry out its constitutional duties. In order to reform the democratic system, the work of the People’s Majlis must be improved and strengthened. ", said the President. President Solih's motto is to maintain an "island-style Maldives". This motto is most closely linked to the fragile environment of the Maldives. 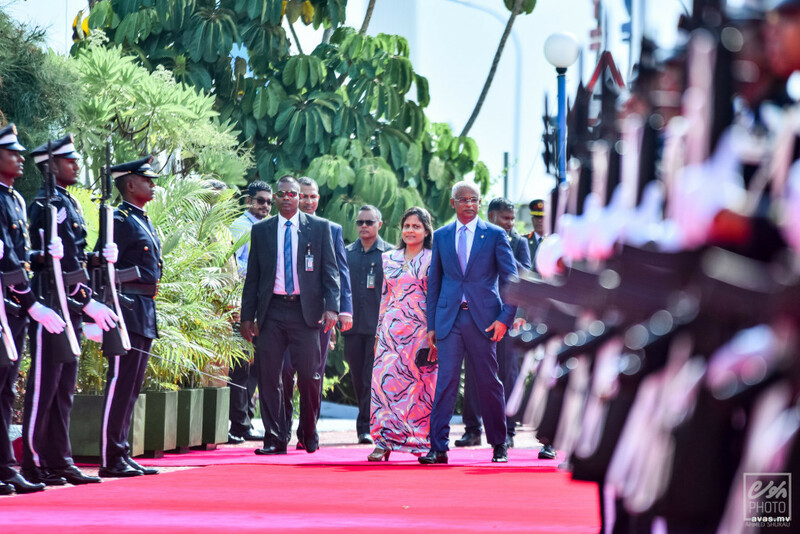 Noting the areas that has been neglected, President Solih reiterated his promise to make Maldives a front face for environmental issues. All development projects will be strategized around preserving the country's environment, assured the president, and noted the importance of maintaining and preserving the country's natural resources in order to ensure that the habitat is safe and resilient. "We shall make our mark on the international arena again as a leading champion of the environment", promised the President. In order to reduce the dependency on oil to generate power, solar energy panels will be installed in 82 islands across the country in a bid to shift to renewable energy sources. The government aims to double the amount of renewable power generated in the country, said the President. The President further noted the importance of protecting the rich heritage and culture of the country. A bill will be presented at the parliament on the legal protection of the country's heritage and culture, revealed the president. "Local councils will be empowered to monitor historical monuments and museums housing historical artifacts. God willing, documentation of heritage and culture with the help of state-of-the-art technology will begin this year", said President Solih. The President noted that the country's economic growth is closely linked with the sustenance of the people. The President revealed that the government is working on ways to increase the sustenance of the people, by determining a minimum wage which would allow the citizens to lead signified lives with an increase in living standard. The president affirmed that the government is working to ensure the benefits of the digital technology reach as many citizens as possible, through which the entire world is now connected. "The Government aims to expedite the utilization of digital communication services through the expansion of high-speed internet services to as many islands as possible. The digital divide presently inherent within the population must also be narrowed and digital mediums would be increasingly relied on upon to provide government services." The President said the country received MVR 21.7 billion as income during 2018. While the government expenditure was at MVR 25.5 billion, the budget deficit was at MVR 3.5 million by the end of the year, The government aims to increase the country's income to MVR 30 billion, said President Solih. While 1.4 million tourists arrived in the Maldives during the previous year, this year, the aim is to attract 1.5 million tourists to the country, added the president. 4000 housing units will be established in reclaimed Hulhumale suburbs, with affordable pricing for its tenants. A “Housing Needs Assessment” is currently ongoing to pave the way for an equitable and solid solution to the lack of proper housing, revealed the president. With its conclusion, a national housing policy will be compiled and implemented within the year, hopes the president. Tenancy Act that outlines the regulations by which housing and apartments may be given for rent, and the Condominium Act that outlines the regulations on the sale of condominiums will also be introduced. The Government is also planning on bringing all housing projects across the Maldives under one roof, the National Housing Corporation. "Our purpose will be to provide affordable housing at significantly lower prices than what was previously offered", said President Solih. The government will begin offering tuition-free degree programs by the end of the month, and the largest amount of the national budget for the current year was apportioned for the education sector, revealed the president. While a budget of MVR 3.4 billion has been allocated for education this year, the government has already implemented a pilot program to provide free breakfast for students. In his address, the President noted that the Maldives had already been isolated and alienated by several countries when he assumed power in November. However, the government's current foreign policy has mended and strengthened friendships with the international community. "But the positive direction that the Government's foreign policy has taken since my assumption of office have been met with acceptance and renewed friendships from the international community." The President further noted that it is imperative for a small island state such as Maldives to build and sustain diplomatic ties in a world made smaller by globalization. The government is already working towards establishing Maldivian Embassies in South Africa, Washington; America and Russia. A Maldivian Consulate will also be established in Jeddah; Saudi Arabia, revealed the president. The President reiterates his promise to ensure that basic needs of the country's citizens are met. Starting from April this year, staple foods will be available in all islands of the Maldives at the same prices as in capital Male', bringing down the prices of staple foods in the atolls, assured the President. The government will make it a priority to establish water and sewerage systems in islands while also bringing down the cost of electricity. The tax revenue from green tax will be channeled via a Green Fund to initiatives protecting the environment, providing clean drinking water and managing waste. All in all, President Ibrahim Mohamed Solih's speech at the inaugural sitting of the parliament was full of hope and optimism. Even the harshest of criticizers can only hope that the President delivers on his promises, without wavering in his persistence and strength in carrying out the obligations of Office and realising the aspirations of the Maldivian people.